Triple Sevens Progressive Blackjack is a unique online progressive blackjack game developed by Microgaming, the leader in online casino systems. 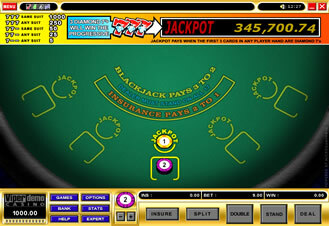 It is a blackjack game which allows a range of bet sizes from $2 to $201 per hand, and is connected to multiple Microgaming casinos. Triple 7s Progressive Blackjack accumulates deposits from its players at all participating casinos and creates giant jackpots. The system enables players to obtain a complete history of their game play for up to 7 days after they have finished playing. To have a chance of winning progressive jackpot you have to make extra $1 bet plus $2 minimum bet per hand. Triple 7's Blackjack is played with 5 standard decks of 52 cards that are reshuffled before each game / hand. The Dealer must stand on all 17. Note: You are eligible for jackpot if you have three sevens on the first three cards of the same hand. Thus splitting in this game will void the chance for a three sevens, and the progressive jackpot, win. Triple Sevens has paid out $42,519.39 to a total of 2 jackpot winners in October. You can also see some large progressive blackjack winners here. The biggest online blackjack winners played Triple Sevens progressive. The progressive starts at $10,000 and grows sometimes over $100,000; approximately at this level the house edge for extra $1 side bet is decreased to zero!